Accra, Dec. 5, GNA - President John Agyekum Kufuor on Sunday said every objective Ghanaian would see that the Government under the New Patriotic Party (NPP) had for the past four years performed so well and efficiently that its achievements were monumental. "The NPP has used its first four years so well and efficiently that its achievements are monumental to every objective Ghanaian", he said. President Kufuor was addressing a rally of the Greater Accra Regional Branch of the NPP at the INDAFA Park at Mamprobi, in Accra. The enthusiastic and jubilant milling crowd dancing to brass band music went into frenzy when the Presidential convoy was spotted at the entrance of the Park with President Kufuor riding in an open Ford Expedition vehicle painted in the colours of the Party. The convoy was forced to move at a snail pace for the distance of about 200 metres to the podium as the crowd surged forward and the security personnel had hectic time controlling them to make way for the convoy. The deafening cheers of the crowd chanting the Party's slogan with a live band music continued until President Kufuor reached the podium and tempo of the cheers increased as he mounted the podium to respond to the cheers with every space on the Park covered with people. President Kufuor thanked Ghanaians for the honour of electing him as their President and giving him the opportunity to serve the nation and to restore the dignity and glory of Ghanaians since 2001. "I will also thank the NPP for electing me as their flag bearer and leader for the 2000 Elections and their support to make significant improvement in the socio-economic development of the country", he said. 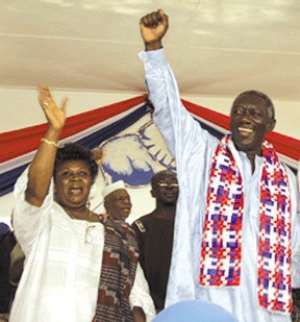 President Kufuor predicted a landslide victory for the NPP on December 7, saying, "Ghanaians would vote on the basis of the political party that could ensure peace, unity and prosperity in the country". He said the main opposition party the National Democratic Congress (NDC) had no message for the electorates and their members were getting nervous and their leaders know that politically they were sinking. He asked the leadership of NDC not to get desperate saying: "All that they have to do is to remain within the laws of the country and have no fears", he added. Mr Felix Owusu Adjapong, Majority Leader, appealed to the electorate not to vote any 'Skirt and Blouse' because any member, supporter or sympathiser of the Party who did so would not be showing any appreciation to the Party and President Kufuor. He said with the Party poised to receive about 75 per cent of the votes during the December 7 Elections the Government required 177 seats to form a comfortable majority in Parliament to push its policies and programmes through to govern under the rule of law. Mr Kennedy Ohene Agyepong, Member of Parliament for Assin North, said the Government would not countenance any confusion or disturbance in any part of the country on December 7. "We are ready for anybody who is preparing to destabilise the prevailing peace in the country, NPP members and supporters should not allow themselves to be intimidated", he said. Miss Theresah Amarley Tagoe, Member of Parliament for Abklekuma South, said the Government had shown much love for Gas with tremendous development projects in all parts of the Greater Accra Region. She called on the people to show their appreciation to the Government and renew its mandate for another four-year term to continue with more development projects.